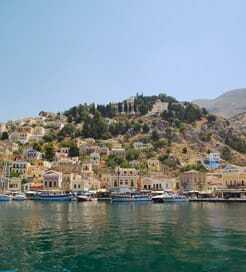 The Greek Dodecanese Islands are situated in the South-Eastern Aegean Sea, between the Cyclades and the coast of Turkey. Comprising of twelve large islands and numerous smaller ones, the island complex is renowned for its beautiful beaches, crystal-clear sea, stunning architecture and a relaxed ambience that is steeped in history. Each island has an individual spirit of its own. Tourists who are seeking tranquillity and relaxation will find an island to suit, whilst those preferring a more vibrant and cosmopolitan atmosphere will also discover a perfect holiday destination. Getting to the islands from the mainland, other island groups and travelling between the islands themselves is inevitably by ferry and with a huge selection of ports, routes and ferry companies on offer, the journey is all but guaranteed to be a stress free experience. The Dodecanese islands can be reached from the Greek mainland port of Piraeus, Turkey, the island of Crete and the Cyclades Islands. Approaching a Greek island from a ferry, witnessing the houses tucked into the coastline amid a shimmering turquoise sea, is a wonderful and memorable experience. Rhodes is the largest and most populated of the Dodecanese. With a main road that runs around the outskirts of the island the pinnacle is at Rhodes Town, the capital. Here, the architecture is predominantly medieval, and the spectacular Old Town is home to the Palace of the Grand Master. Boasting sandy beaches and lush vegetation, Kos also has a heritage of mythology and history. Hippocrates, the father of medicine was born on the island around 460 BC, and founded the Great School of Medicine of Kos. Kalymnos has a global reputation for its sponge fishing divers. This activity has a long tradition on the island and makes a significant impact on the local economy. Many other islands in the Dodecanese exhibit unique charms and whatever your expectations of a Greek Island holiday they will be met and exceeded in the Dodecanese Islands. 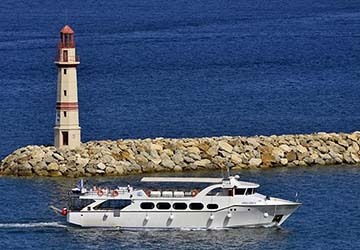 For more information, please visit our Ferries from Cyclades Islands to Dodecanese Islands page. For more information, please visit our Ferries from Ikaria to Dodecanese Islands page. For more information, please visit our Ferries from Aegean Islands to Dodecanese Islands page. For more information, please visit our Ferries from Greece to Dodecanese Islands page. For more information, please visit our Ferries from Lesbos to Dodecanese Islands page. For more information, please visit our Ferries from Athens to Dodecanese Islands page. For more information, please visit our Ferries from Samos to Dodecanese Islands page.